Our new website has just had its 2,000th user. Appropriately, they were from Colchester. On the same day, there were other visitors, from Chelmsford, Braintree and Clacton, some returning to check for new additions perhaps. We’d be delighted if people would keep using us, tell their family and friends – and alert us to new learning opportunities for us to feature. 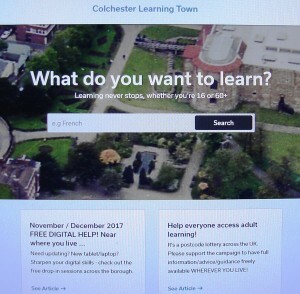 It’s never too late to learn in Colchester! Great idea. Without the Learning Shop and Greyfriars in the town centre there’s no easy way to just walk in and see what’s available everywhere. Pity for those who aren’t on the net though. perhaps you could try to get the libraries involved? Thanks LL. We’ll talk to Essex Libraries about it.